No. The Interior Ministry announced the first results within an hour of the polls closing and the official result less than a day later. The ministry is supposed to wait three days after voting before it certifies the result, to allow time for disputes to be examined. Friday's announcement, which was based on a very small count, came just minutes after Mousavi declared himself to be "definitely the winner." According to a Mousavi official in Paris, the opposition leader was initially informed by the Interior Ministry that he had won. But ministry officials shortly thereafter publicly called it for Ahmadinejad. Gary Sick, a Columbia University professor and Iranian-affairs adviser for three U.S. Administrations, said that given the apparent record turnout, it would have been impossible to announce a definitive result so soon after the polls closed, because Iran does not use voting machines. The country uses paper ballots that must be counted by hand  a time-consuming process, Sick said in an interview posted on the Council on Foreign Relations website. A fast announcement is not necessarily proof of rigging, says John Stremlau, vice president for peace programs at the Carter Center, which has monitored 75 elections over the past two decades. But for people to have confidence in those announcements, a country needs an independent electoral commission that acts fairly and transparently. "You have none of that in the case of Iran," says Stremlau. 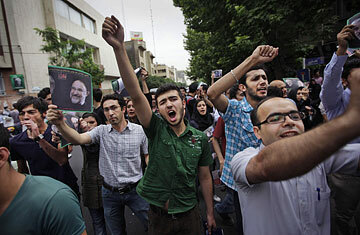 See pictures of Iran's presidential elections. Next Are Any of the Vote Totals Suspicious?